A recent article by Sam Walker in the Wall Street Journal argues that better managers are the key to delivering better results. Walker cites research by Gallup showing that the quality of middle managers determines 70% of the variance between high-performing and low-performing companies. Because managers can instill (or at least heighten) a sense of purpose and meaning in employees’ work, they drive the critical measure of employee engagement, which Gallup defines as a belief among employees that they’re doing meaningful work in a climate that supports personal growth. And that in turn leads to lower turnover, higher productivity and better profits. This isn’t really an earth-shattering insight (even if the high level of correlation is eye-opening). We’ve all heard the maxim that workers don’t leave companies; they leave their managers. So this makes sense. Now, it’s not always easy to connect an organization’s product or service to something “meaningful.” Not everyone works in an organization singularly focused on eradicating river blindness or rescuing otters. It’s a lot harder to talk about meaning when you work in a quarry or a factory making low-density polyethylene squeeze bottles for ketchup. And there are plenty of days when the work you’re doing—no matter where you're employed—isn’t going to feel particularly meaningful (notwithstanding the apocryphal story about JFK and the janitor at NASA who proudly explained that he was helping put a man on the moon). But what’s most dangerous in Walker’s prescription is that companies simply need to hire (or train) better managers, and everything will be right with the world. He places the burden for increasing engagement on the individual manager. That seems risky to me. There’s so much variability in people and environments that a “good” manager in one situation might not be a good manager in another. What if instead we created mechanisms to increase employee engagement? What if we set up policies and processes so that it’s easy for people to grow in their jobs? That’s the beauty of focusing on improvement. Every job does provide an opportunity to grow. Challenging people to improve the process by which they do their jobs harnesses their creativity and their innate desire to succeed, leading to higher engagement. Unfortunately, too many organizations pay lip service to the notion of improvement without creating mechanisms to make it happen. They won’t spend the money to give workers enough training: A woman I know in the OpEx department of a $30 billion company needed three weeks to get approval for the $900 to attend a recent conference. Or they rely on suggestion boxes (“Where good ideas go to die”) rather than openly posted improvement boards. Or they don’t provide workers with the slack time they need to do improvement work—workers are paid for a 40-hour week, and it requires the papal seal of approval to get overtime pay for improvement work. Cambridge Engineering in St. Louis is an example of a company that has created these mechanisms. Workers get training in lean and problem solving, of course, but even more importantly, they have 30 minutes every day to do “lean and clean”—work on improvement projects, or just clean/maintain/5S their areas. During their busy season, the company unquestioningly pays overtime to ensure that everyone has the ability to do their half hour of daily improvement. Of course, these mechanisms don’t guarantee a high level of employee engagement. But they reduce the reliance on the talents of individual managers and increase the likelihood that employees will feel their jobs provide them with the opportunity for personal growth. Toyota says that there are two aspects to every job: doing the work, and improving the work. Instead of relying on individual managers for employee engagement, let’s rely on this second component for higher employee engagement—and higher company profits. I’m heading to Houston tomorrow for the LEI Summit—always an exceptionally inspiring and educational event. I’m particularly excited to visit Houston because I just saw the new documentary, Apollo 11. It’s amazing. Composed of video taken by NASA and the Apollo 11 astronauts, along with Walter Chronkite’s actual description of the events, the movie provides a kind of fly-on-the-wall perspective of the now 50-year-old mission. It’s riveting. You seldom get to see such tight coordination of knowledge workers. In physical assembly lines or manufacturing facilities, sure. But knowledge workers are more disconnected—communication and information flows asynchronously through emails and memos. Much of their work is done on a “push” basis, rather than pulled at the moment of need by customers, which reduces not just the drama, but also the inherent tension of the need to do the job precisely right. But in the go/no go poll, you see dozens (hundreds?) of knowledge workers coordinating their efforts as precisely as any high-tech robotic fabrication machinery. Each person (and each team) delivers exactly what the flight director needs exactly when he needs it. It’s a symphony of work, a ballet of knowledge, a miracle of coordination. And when you’re choking on yet another stupid “reply all” email, it’s utterly inspiring. A prospect told me recently that he wanted to work with me to bring lean/continuous improvement to his company, but first he needed to “integrate it into his Training and Development” plans. I told him that he was making a mistake, and that he was likely to fail. If you frame lean/CI as a training and development activity, you won’t get the of buy-in and commitment from staff that you need. Lean becomes something nice to do, not something that must be done for the long-term success—and survival—of the company. To be sure, when lean is done well, it IS a skills and human development activity. John Shook and others have written extensively about how lean is a socio-technical system, not just a collection of tools. And yes, some training is required to learn both those tools and the fundamental way of thinking. But try getting a plant manager, or the leadership team of a company, to commit the necessary time and attention when they see lean as simply another training and development offering of the HR department. You’d have as much success telling your 10 year old that meditation and yoga are important for success in a PE game of kickball. Maggie Jackson, a journalist focusing on the effects of technology on the nature of our humanity, and author of the book Distracted, recently highlighted research showing that the mere presence of a cell phone—even if it’s turned off—lowers “fluid intelligence.” That is, the phone essentially siphons our attention away from what’s in front of us, making it more difficult to solve unfamiliar problems. She cites other research demonstrating that instantaneous access to information (I’m looking at you, Google) makes it less likely that we’ll struggle to solve a new problem. Even a brief online search for information reduces our willingness to engage in the cognitively challenging process of deep thinking. In our current culture, “knowing” is becoming something brief, perfunctory, neat, packaged, and easily accessible. Yet complex murky problems demand firstly the willingness not to know, to understand that the time for ease in thinking has ended and the real work of reflective cognition must begin. And second, difficult problems demand tenacity, a willingness to struggle and connect and reflect on the problem and its possible solutions and move beyond the first answer that springs to mind. This is when we must extricate ourselves from automaticity in thinking and call consciously upon the side of ourselves that can decouple from tried-and-true answers, gather more information, test possibilities, and build new understanding. Given this situation, is it any wonder that we have difficulty solving the complex problems that afflict our organizations? Is it any surprise that we struggle to avoid easy, reflexive “solutions” that seldom address the root cause of a problem? Who wants to take the time to work on an A3, or DMAIC, or 8D analysis when you can just do somethingand get plaudits from the CEO for being a take-charge employee who gets stuff done? Why chew through a (real) bagel when you can have a donut? Ask the participants to list a few problems and solutions to them. Introduce the concept of PDSA (but without teaching any root cause analysis tools). Have the participants list the same problems as before, but this time with possible root causes—and suggest potential countermeasures to those root causes. Each time, the participants come up with different countermeasures. Karen points out that even though their solutions may not be “best,” by simply inserting an additional step she was able to shortcut reflexive knee-jerk responses, and push people towards deeper, reflective consideration. Today’s omnipresent, always-on, completely seductive technology makes it even more difficult to think deeply about problems. It distracts us, and it weakens our mental muscles. It’s incumbent upon lean thinkers to help people overcome the natural and the technological hurdles to deep thought. Karen’s experiment is one way to do this. I’ve suggested another approach. Neither of our techniques is the ultimate method of problem solving, of course, but they’re both useful in developing the right mindset. The skill set can follow. One of the great benefits of the 2 Second Lean approach to lean is the way that it gets everyone engaged in kaizen with simple improvements. The genius of Paul Akers’ approach is the low barrier to entry for workers. But as I’ve written about before, the problem with 2 Second Lean is the high barrier to entry for leadership. If leaders aren’t completely, continuously, and passionately involved as improvers and cheerleaders, it just doesn’t work. It becomes a trivial exercise distracting people from solving real problems. As one of my clients said to me, “Frankly, it’s hard to see how moving the garbage can closer is going to move the needle on our business.” Ouch. And yet I’m also not a big fan of kaizen events. Sure, they have their benefits, but they tend to make continuous improvement discontinuous. Besides, copying an approach that was specifically designed to make life easier for Japanese consultants who flew back and forth between the US and Japan is like buying a buggy whip for your car, because it used to be a horse. That’s why the presentations and the experiential workshops at the Katacon Summit last week in Savannah were inspiring. They reinforced the way that Toyota kata provides a path with a low barrier to entry by encouraging small experiments on individual obstacles. At the same time, kata ensures that leadership and internal skeptics can’t dismiss the improvement work as trivial by using the challenge to align the work with important business objectives. And finally, the requirement to have both a coach and a learner dealing with the gap between the current condition and the target condition means that employee engagement and managerial support will be high. There’s no easy or universal path to creating a culture of continuous improvement. It’s a long, difficult trip, and each organization needs to find a route that works for its own idiosyncratic needs. My experience at the Kata Summit last week, though, makes me think that this is a great approach to try. Residents weren’t stupid—they understood that the trees provided more shade, better air quality, and increased property values—but they still elected not to have trees planted for them. As Brentin Mock explains in his CityLab article, the well-meaning volunteers made several fundamental errors that explain why their efforts failed. And that explain why so many of our well-meaning lean improvements fail as well. 1. The Arrogance of the Enlightened: the volunteers from TGD “presumed to know what’s best” for the poor communities. The trees are unquestionably good for those families, but no one was included in the decision-making and planning processes. Instead, the volunteers simply assumed that their noble efforts would be valued and welcomed. They decided unilaterally what kind of trees to plant, which neighborhoods to plant in, and what the maintenance protocols would be without any input from residents. How often do executives, internal CI leaders, or external consultants make the same mistake? It’s true that lean does make work easier and safer, but we often don’t include the workers in the initial discussions about what lean is, why lean is important, why the organization has chosen this approach, and where the initial efforts will be made. Sure, workers are introduced to lean before changes are implemented, but by that time the decision to go down that road has already been made in a conference room with executives and lengthy Powerpoint presentations. It’s no surprise when they “resist change”—just like the Detroit residents rejected the trees. Whether it’s the outside consultants or a new leadership team, the promoters of lean are often ignorant of the context of continuous improvement efforts in the organization. Perhaps people were laid off years earlier during an effort to get “lean and mean.” Or maybe continuous improvement was used to justify making people work harder and faster, with fewer resources. Regardless of how often the new management or consultant spouts the “respect for people” mantra, workers will be suspicious that it’s the same thing as before. 3. Neglecting the Externalities: Planting trees is not a simple, one-time activity. Residents knew that they’d be responsible for the long-term care of the trees, such as watering and fertilizing them when they’re young, raking up leaves in the fall, dealing with sidewalk damage from spreading roots, and clearing fallen limbs after storms. Not all residents wanted that responsibility—or, at the very least, they wanted a voice in the decision-making process, since they’d be taking care of the trees. Too often we neglect the externalities of a lean transformation. It requires that workers either do their jobs faster so that they have time for improvement activities during the day, or that they stay late to do their improvement work. But it’s not fair to workers to ask them to take on these burdens without additional support. Not many companies follow the lead of Cambridge Engineering, which pays people overtime to do their improvement work if it can’t be done during their regular shifts. Not many companies give workers time off to develop public speaking skills or fundamental MS Office competence, even though those skills are useful in leading shop floor improvements. Bring workers into the earliest discussions about lean. Don’t wait until the leadership team has decided to do it. Involve them in the decision. Learn the history of past improvement efforts. Are certain words toxic, or loaded with hidden meaning? Did certain production lines, departments, or plants have particularly painful experiences in the past? Were employees hurt by earlier improvement efforts? This knowledge will help you anticipate and mitigate problems. Consider the new burdens lean places on workers, not just the benefits it confers. You’ll need to provide them with more support so that they can fully engage in improvement. Extra skills training, overtime pay, early morning or late night transportation to and from work, etc. are important signals that you understand—and support—the commitment they’re making to the lean effort. Last week, I wrote about how kaizen events can disrupt daily operations and overburden employees. In addition, they tend to signal that “continuous improvement” is actually discontinuous. (“We have a kaizen event this week. Next week it’s back to business as usual.”) I pointed out how companies can make kaizen a daily practice by setting aside standard time, or by using the Toyota kata approach of small experiments. A final cause of self-inflicted disruption is management’s overreaction to noise in the data it measures. Managers capture all kinds of metrics, from the number of patient falls in a hospital ward, to the first pass yield in a production line, to the number of hits on a website, to the time it takes to repair a bicycle. They cover walls with graphs, and launch investigations when a number turns red or a trend turns downwards. However, not every change is meaningful. Too often, leaders react to every up and down in the metrics, asking for explanations and root causes that don’t actually exist. This kind of overreaction disrupts the organization and leads to activity that is more busy than useful. Some changes in metrics are just noise in an otherwise stable system. In his book Measures of Success, Mark Graban makes a compelling argument for more use of Process Behavior Charts (PBC), rather than bowling charts, bar graphs, or a table of numbers. PBCs (also known as process control charts) provide a holistic view of a system’s performance over time, allowing us to hear the “voice of the process.” This context enables management and front line workers to determine whether a change is significant, indicating that something has fundamentally shifted in the system and is worth investigating. As Graban writes, using PBCs subtly shifts the question from “What went wrong last week?” to “What was different last week?” Or even better, “How can we improve the system and its typical performance?” The result is less disruptive overreaction and empty explanations (what Professor Don Wheeler calls “writing fiction”) and more time spent on true value creating work. One of my own clients learned this lesson in tracking throughput at its repair facility. For months, the chart turned red or green based on the number of completed repairs each day, leading the VP of the facility to pressure workers, or congratulate them, based on the color in the bowling chart. This was both stressful and frustrating for his mechanics, since they felt as though they were working equally hard everyday. Only after we made a PBC could we see that the the variation was simply noise in the system—there was no statistical significance to the change in the daily number of repairs. And with the chart, we were able to identify—and celebrate—when our changes truly improved the performance of the system. Companies that create truly valuable disruptive products and services rightly reap outsize economic rewards. However, the headlong pursuit of external market disruption can blind leaders to the existence, and the cost, of internal disruptions caused by their own business practices. To be sure, some internal disruptions can be beneficial to the company by significantly streamlining processes. But when the disruptions lead to excessive unevenness in daily operations, they create distortions that stress employees, systems, and supply chain networks. By all means, pursue disruption for competitive advantage—but be careful not to disrupt yourself. Last week, I wrote about how batch processing—whether in manufacturing processes, office processes, or even team management—creates unevenness and disrupts the smooth flow of work and value to the customer. This week I’d like to address the disruption caused by kaizen events. Companies that realize the greatest benefits from lean don’t do kaizen events (and that includes Toyota). Rather, they make kaizen a daily activity. Cambridge Engineering, an HVAC manufacturer near St. Louis, for example, has explicitly carved out 30 minutes everyday for employees to do “lean and clean.” Other companies are less structured about it, but still benefit from embedding improvement efforts into the fabric of daily activities without disrupting the overall flow of work. In fact, one of the great benefits of the Toyota Kata approach is that the size of each experiment is small by design. Crafting small experiments to move towards a target condition that can be achieved in a couple of weeks means significantly less disruption to the people and the processes in the organization. To be sure, sometimes implementing an improvement will necessitate shutting down a production line or a department for a few days—but not nearly as often as you might think. Next week: Reacting to Noise in the Data. Last week, I wrote about how sales incentives cause salespeople to stuff the company’s distribution channels with inventory far in excess of consumer demand. Volume discounts have the same effect, by encouraging customers to order more product than they need in order to get a larger discount. Not only do incentives wreak havoc on the supply chain through the “bullwhip effect,” the unevenness stresses employees and creates waste in customer service, distribution, and other functional areas. This week, I’d like to address batch processing. It may be counterintuitive, but long production runs and large batches create disruptions in the flow of work compared to one-piece flow or small batch sizes. During the batch there’s little disruption, of course. But at the changeover, everything and everyone stops to move machines, change out dies, put different raw materials in place, etc. And it’s not just an issue in manufacturing—large batches create disruption in office and administrative processes as well. Shutting down a warehouse for two days to do physical inventory, for example, is incredibly disruptive, with ripple effects throughout the business, from supplier to customer. Similarly, most finance departments in large companies cut their activities to a bare minimum during the month-end close of the books, which often can take up well over a week. Toyota, most notably, has demonstrated the financial and quality benefits of one-piece flow over large batch processing in manufacturing. But working in smaller batches and avoiding disruption in office processes yields significant benefits as well. For example, many distribution centers use cycle counting to manage their inventory, avoiding the need to shut down the facility. Boeing’s finance department processes some of their financial information on a daily basis, rather than waiting to process a large batch at the end of the month. They look at what shipped each day, what materials were received every single day, and what bills were paid every single day. As a result of this (and other) changes, they reduced the time required to close the quarterly books from nearly one month to five days. In HR, too, many companies are getting rid of the annual performance review in favor of shorter, more frequent discussions as often as once per month. This not only provides more timely and effective feedback for employees, but it eliminates the massive time commitment imposed on managers in November and December. Finally, consider the typical weekly or bi-weekly meeting for a team: the manager is working with a one- or two-week batch of information. Not only is it difficult for the manager to process that much info in a single meeting, for everyone else, it’s about as interesting as reading last week’s newspaper. And by the time the manager gets the update, the information is at least a few days out of date. Far better to use daily huddles and stand-up meetings to exchange information. Batch processing is rampant in most organizations and most functions. The sooner you can transition to one-piece flow (or at least small batches), the easier it will be for everyone to do their jobs. Last week, I wrote about how the unpredictability of “management by walking around” disrupts daily operations in an organization and leads to mura (unevenness), muri (overburden), and muda (waste). This week I’d like to address sales incentives and volume discounts. Incentives and discounts create tremendous disruption in a company’s business by distorting both incoming market signals and outgoing orders to suppliers. Sales incentives—for example, bonuses to meet monthly or quarterly revenue goals—cause salespeople to stuff the company’s distribution channels with inventory far in excess of consumer demand. Volume discounts have the same effect, by encouraging customers to order more product than they need in order to get a larger discount. Both these practices wreak havoc on the supply chain through the “bullwhip effect.” Hau Lee, professor at the Stanford Graduate School of Business, illustrates this problem with a story about Volvo: in the mid-1990s, the Swedish car manufacturer found itself with excess inventory of green cars. The sales and marketing departments began offering special deals to clear out the inventory, but no one told the manufacturing department about the promotions. It read the increased sales as a sign that consumers had started to like green cars, and ramped up production. The former president of Wiremold, Art Byrne, explains in his book The Lean Turnaround that he eliminated volume discounts and incentives for sales to book the largest possible orders. Instead, he pushed his sales team and his customers to provide a steady flow of small orders that would smooth demand and reduce disruptions. Large customers received cash rebates at the end of the year as a reward for their business, but without the supply-distorting incentives for large individual orders. This clever approach allowed Byrne to square the circle: provide incentives without increasing demand variation. It’s worth mentioning that not all incentives are bad—only poorly designed ones are. In highly seasonal businesses, they can actually be a useful tool for leveling demand and reducing unevenness. I consulted to an outdoor goods company whose warranty department got into trouble every summer. Usage for this company’s products are overwhelmingly concentrated in summer months, and as you might expect, consumers wouldn’t send their products in for warrantee repair till the summer started. The sudden spike in warranty requests meant that lead time exploded from less than a week to five or six weeks. The company reduced the fluctuation in demand by sending out regular emails to customers from January-March, reminding them to send in their products for repair early, and promised a free logo t-shirt for people who sent in their item before April 1. This incentive not only increased the number of items that came in early, it got more brand logos on the street. With more level demand, the warranty department was able to keep its turnaround time to under a week, even during the peak summer season. Taiichi Ohno, one of the fathers of the Toyota production system, described three manufacturing evils that companies should avoid: mura (unevenness), muri (overburden), and muda (waste). In fact, unevennness is often a cause of overburden, which leads to the much of the waste that companies are so eager to eliminate. Unevenness in any aspect of a business—customer demand, process time, quality of raw materials, staffing, etc.—results in overburdening some resources at the expense of others, or alternating between overburdening and underutilizing a resource over time. For example, the spike in toy demand at Christmas puts enormous pressure on factories, warehouses, and logistics providers, to say nothing of front-line retail staff. Similarly, unevenness in machine availability will cause workers and machines in downstream processes to be alternately starved and overburdened with work. Unfortunately, while pursuing industry disruption for a better share in the market, leaders are often oblivious to the disruptions that their personal actions and business practices create for their organizations. These disruptions generate enormous unevenness for employees and processes, and make it more difficult for the organization to excel. In this five part series, I’ll describe five types of disruption that can undermine a company’s performance. in their seminal book In Search of Excellence, Tom Peters and Bob Waterman popularized the concept of “management by walking around” (MBWA), encouraging leaders to get out of their offices and randomly walk around the company to see firsthand what’s going on. They specifically advise managers to make their walks unpredictable, both in terms of where they go and when they go. Peters and Waterman believe that if frontline workers are expecting management’s visit, they won’t see what’s really happening on a regular basis. They argue that frontline staff will work differently; they’ll clean up their work area; they’ll cover up small problems. Leaders won’t get an accurate picture of how the processes are operating. But this kind of unpredictability is a powerful form of disruption for the worker. If a senior leader randomly shows up, the workers will inevitably be anxious and stressed. They’ll work differently under the watchful eye of the boss, possibly creating variability in quality of their work. Or worse—they’ll stop working while they answer questions, affecting the timing of a production line, and creating unevenness for downstream workers. In contrast, organizations that have embraced lean thinking, like JD Machine, Stanford Medical Center, Lantech, and others, substitute standardized “gemba walks” for random MBWA. At these places, the leadership team has a regularly scheduled walk through the various departments to see first hand what’s happening. There are no surprises for the staff—they know who’s coming and when, with the result that these visits are smoothly integrated into daily work without disruption. Moreover, it’s both helpful and rewarding for front line staff to know that they’ll get to talk with the CEO or VP of Operations on a regular basis. Next week: sales incentives and volume discounts. The title of Art Smalley’s new book, Four Types of Problems, is misleading. It doesn’t actually address four types of problems. Rather, it covers four types of problem solving. In that regards, it’s an excellent reference book that belongs on every bookshelf. Type 1: Troubleshooting.Quick response that provides immediate relief without getting at the root cause. In the case of the machine tool, this was cleaning the metal chips off the tool during the shift so that it wouldn’t seize up. Of course, this led to significant down time. Type 2: Gap from standard.Identifying the root causes of a problem that prevent something from operating as it should. The 5-Why inquiry that identified the lack of a strainer, and kept production on target, is emblematic of this type of problem solving. Type 3: Target condition.Setting a higher standard than is currently used and reaching it through kaizen. This type of problem solving led Toyota to figure out how to reduce the need for cleaning out the metal chips so that they could run the tool with higher uptime and shorter lead time in the service of better meeting customer demand. Type 4: Open-ended.Innovation that seeks to fundamentally change how something operates. Toyota added sensor technology, industrial washers, and larger combined systems to better manage the cutting chip waste. So again, not four different types of problems, but rather, four different ways to deal with the one problem of cutting chip waste buildup. After a chapter-long digression on the history of problem solving approaches, Smalley takes a deep dive into each of the four types of problem solving. He discusses the conditions that call for each approach, identifies key points of each one, and calls out their strengths and weaknesses. There are valuable insights in this section that I’ve often overlooked. For example, in Type 1 problem solving, Smalley cautions that “people naively assume that documentation and training are the best or only way to make countermeasures stick. That view is incomplete and should be challenged.” Similarly, “a weakness of this method [Type 2 problem solving] is that it can lead to an attitude of acceptance of the status quo, which can lead to a general lack of inventiveness.” I know that I’ve fallen prey to this tendency in my own consulting. Some organizations will try to jump from Type 1 troubleshooting to Type 3 level of improvement activities to save time. This strategy will rarely be successful. Even when it is, the success is essentially a matter of luck. The necessity of tackling existing gap-from-standard problem cannot be wished away or ignored in favor of a Type 3 approach. Gap-from-standard problems are rampant in most organizations, and they require the discipline of definition and root-cause analysis to solve and ensure stable operations. He points out that Toyota’s remarkable success in Type 3 (improve the target condition) problem solving is built upon its focus on Type 1 (troubleshooting) problem solving in the 1950s and ‘60s, and its subsequent attention to Type 2 (gap from standard) problem solving skills. The section on Type 4 problem solving is a foray into the world of innovation and the various approaches to it: lean startup, design thinking, set-based product development, TRIZ, etc. all get their turns on stage here. “Innovation” seems to be the business buzzword of recent years, which makes Smalley’s admonition against “succumbing to the allure of breakthrough innovations to the neglect of the first three types of problem-solving approaches” all the more important. If you’re familiar with the different ways of approaching problems, Four Types of Problems is a useful reference book. If you’re introducing your team to the concept of a methodical, structured approach to problem solving, this is an invaluable primer. You won’t need to look at it all the time, but you’ll be glad to have easy access to the information. The overhead light in aisle two has been burned out for three months. It’s hard for the workers in that row to see the small parts they handle and repair. Workers sent a request to the facilities department when the light died, but for some reason nothing was done, and no one bothers to complain anymore. Fifteen percent of the stations are missing the adjustable stools workers sit on when they’re doing repairs. Workers at those stations either stand, or use folding chairs, or office chairs. Another 10% of the stools are missing some of the casters, so the stools wobble when they sit on them. The full-size paper drinking cups were replaced with tiny two-ounce cups by an over-eager executive in the finance department looking to cut costs. That may be fine if you’re running an espresso bar, but not in an industrial facility without air-conditioning, where the temperature can easily reach 90 degrees in the summer. Do I even need to tell you that the company is struggling with both productivity and quality? That workers don’t seem committed to their jobs? That tool theft is a problem? That workers “steal” time by stretching their breaks? I’ve been working with this company to improve performance on the shop floor, but progress has been incremental. I’ve drawn value stream maps of the process, stood in an Ohno Circle and watched closely for the seven wastes, and engaged workers in Toyota Kata, but without a tremendous amount of success. It was only after a couple of months at the site that I finally noticed the burned-out light, the missing/broken stools, and the pathetic paper cups. My slow progress finally made sense: You can’t get people to care about their work until you first show that you care about them. Bad lighting, bad seating and bad drinking doesn’t exactly scream care and concern. Shame on me for not seeing this problem earlier. what changed the culture at NUMMI wasn’t an abstract notion of “employee involvement” or “a learning organization” or even “culture” at all. What changed the culture was giving employees the means by which they could successfully do their jobs. At NUMMI, that meant the tools, the training, and the managerial support that was so badly lacking in the old GM organization. Organizational development expert Edgar Schein argues that the way to change culture is to change cultural artifacts—the observable elements of an organization, which include what people do and how they behave. That’s what NUMMI management did, by showing in all ways, large and small, that they cared about the workers and believed in their intrinsic motivation, and not just pushing product out the door. What story do the cultural artifacts at my client tell? That management really doesn’t care about the workers as human beings—no matter how much they say the opposite. To be clear: I am NOT indicting my client for running some sort of Dickensian sweatshop. Having spent many days at their factory, it’s clear that management really does care. And it’s not as though the management is uniquely inept or cheap. In fact, the management is actually quite good—the new plant manager, in particular, works hard, is concerned about employee welfare and is more than willing to spend money when he needs to. But this issue is something that all companies deal with, at one level or another—issues that get lost in the shuffle, as they get passed from one department to another, or from one person to another. Or small issues that don’t necessarily make it to the radar screen of leadership even if they’re important to the employees. But while they may be small, they nevertheless send an unambiguous signal of disrespect. And until management shows that they care about the workers, the workers won’t care about the products. I pointed this out to the plant manager last week. They now have a full complement of working stools and full-sized cups. They’re working on the overhead light this week. I’m hopeful that now we’ll start to get traction. I’ll keep you posted. I’m back from joining Honsha on their semi-annual Executive Development Mission to Japan. It was a remarkable learning experience — although I’ve been on two other study trips to Japan, there’s always something new to see and understand when you visit a company that has adopted (and adapted) the Toyota Production System. He made this comment when we mentioned how impressed we were with the kaizen done in a production cell. It was an incredibly efficient cell already, with no obvious waste that we could see. The president pointed out that in a recent kaizen, one of the workers had moved a handle to reduce his arm motion by approximately three inches. (This was in a cell where the cycle time was less than a minute.) It didn’t change the amount of walking or the overall cycle time. It just reduced the amount of reaching with his right arm. Such a small improvement was clearly the result of careful observation and thinking. Frankly, it would have been easy for a worker to say that there was no room for more improvements. But the president steadfastly believes that before you can ask for big improvements, you have to be able to find small improvements. To me, there are two levels of meaning here. Most obviously, one second is composed of tenths — you’ll have to combine ten of them to save one second. And if you can’t find even 1/10, you’ll never get one second. On a deeper level, developing the eyes to see a one second improvement takes practice. It’s hard to see the opportunities for large improvements if you can’t even spot simple, small improvements. That’s a good reminder for leaders that kaizen means *continuous* improvement, not necessarily large improvements. The foundation for major improvements is built with bricks of 1/10 of a second. The hoshin kanri X-matrix makes my head hurt. I mean, kudos to the person who invented it for creating something so incredibly compact and information-dense. 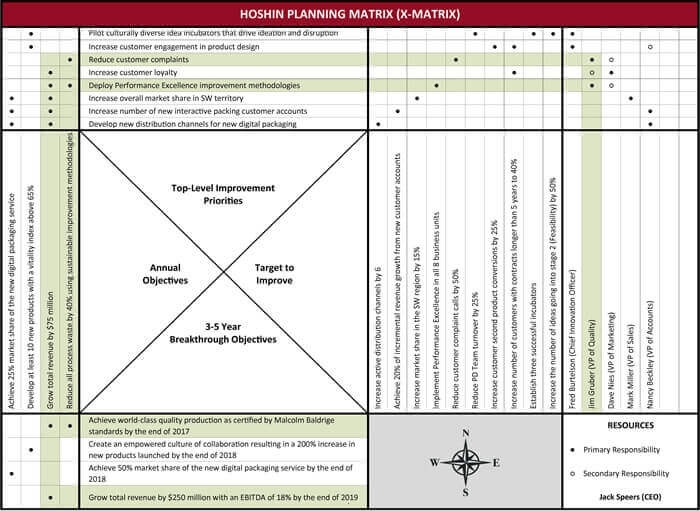 But I’m not sure it’s the easiest way to convey the information in the hoshin plan. Small dots in three locations on a spreadsheet with text running in two directions isn’t a recipe for easy digestion. As a result, I’ve been using a series of spreadsheets adapted from a template by Karen Martin. Karen’s template is great for making the goals and projects of the annual plan easy to read, since you don’t have to rotate your head like a great horned owl to read the X-matrix. However, one of my clients recently struggled to understand the connection between the corporate goals and their associated projects, and the projects with their associated tasks. The vertical relationship between these three levels—generated through catchball—got lost in the multiple spreadsheets. They couldn’t see how these levels were tied together. This has become one of the most widely used charts in the company. The relevant teams hold hoshin review meetings around it as they track progress towards their departmental goals, and they have a clear picture of how their daily work ties into the larger corporate goals. This was a terrific improvement on the spreadsheets that I originally gave them. Give it a try—it might work for you, too. Some of the obstacles I ran into were predictable to anyone who’s used kata before—people jumping to solutions rather than identifying real problems, focusing on symptoms rather than root causes, turning the discussion around obstacles into a (long and loud) general complaint session. But the big surprise for me was how difficult it was for the team to grasp the terms that I put on the learner’s storyboard. “Focus process,” “target condition,” etc. may be perfectly familiar to me, but they were about as accessible as a German language menu in an Applebee for the mechanics. They weren’t comfortable using those words, and they struggled to understand the meaning of a phrase like “focus process.” So not only was I presenting them with a new way of thinking about their work, I was essentially asking them to learn a foreign language. (Ironically, my book Building the Fit Organization was written precisely to explain lean principles without using Japanese buzzwords or references to Toyota.) This is a beautiful recipe for failure. Of course, I wasn’t perceptive enough to see the problem. One of the managers had to point it out to me. I haven’t run these changes past Mike Rother, but I think that he’d approve. After all, the terminology doesn’t really matter. What’s important is learning how to think—and experiment—scientifically. And if changing the language makes it easier to grasp the new way of thinking, so much the better. It’s time to admit that one of my consulting approaches has failed. I’m a huge fan of Paul Akers’ 2 Second Lean philosophy. It’s simple, easy to understand, and has an intrinsic appeal: “fix what bugs you.” “Figure out how to do your job two seconds faster each day.” Who wouldn’t sign on to a lean program that promotes that mindset? So off I went to my clients, with Paul’s videos embedded in my PowerPoint presentation, ready to show them how 2 Second Lean is the answer to their productivity problems, their low employee engagement and morale scores, their mediocre customer service, and their too-high defect rates. When I look back at the clients I introduced to Paul’s method, I have to be honest and admit that a more traditional, kaizen event-driven approach would have served them better. 2 Second Lean didn’t hurt them, but they didn’t reap the rewards that they wanted, and that I promised. I missed the most obvious fact: 2 Second Lean is simple. But it’s not easy. The commitment required of the president is enormous. If you want to follow in Paul’s footsteps, you really have to follow in Paul’s footsteps. That means that you have to be a relentless, maniacal cheerleader for lean. You have to be at the office nearly everyday, talking to everyone, asking them to show you their improvements. You have to make videos of every little kaizen, and show them to the whole company at the daily huddle. You have to celebrate—loudly and visibly—every single improvement, no matter how small, every single day. You have to be more excited about the improvement than the person who’s actually made it. How many presidents/CEOs are willing to make that commitment? Not many. Travel gets in the way a lot. There are other meetings to attend, other issues to address, other decisions that only the president can make. So the president misses a day, or two, or a week. He supports 2 Second Lean, but he doesn’t lead it. If you’re trying to get the kaizen flywheel turning from a dead stop, you have to constantly put energy into it. You can’t build momentum if you slack off even for a moment. At best, employees will assume that the president doesn't really care that much about 2 Second Lean—it’s nice, but it’s not as important as their day jobs. At worst, they’ll decide that it’s just another flavor of the month, and they’ll wait for it to go away. There are people who understand this. Paul has a host of acolytes who have embraced and succeeded with his approach. Their companies are doing great—they’re growing profitably, and they have terrific employee morale. Day by day, they’re building wonderful businesses. These leaders have committed wholly and completely to the daily care and feeding of the kaizen mindset. They talk to all employees about their latest improvements, and they celebrate and share all the kaizen work that’s being done in their daily meetings. My mistake? I didn’t adequately determine whether or not the presidents of my clients were willing to make that commitment. They all liked the idea of 2 Second Lean, but they weren’t willing to dedicate the time, effort, and energy to getting the lean flywheel turning. That was my fault. As a consultant, it’s important to live in the world of the possible, not the world of the desirable. It’s incumbent upon me to tailor an approach to the constraints of a given situation. If a client is willing to follow in Paul’s footsteps, then great. If not, it’s my responsibility to find a different approach. I’m excited to announce that I’ll be joining the Japan Executive Development Mission to Japan from October 7-13, 2018 as guest faculty and facilitator. Having been part of different Japan study trips in the past, I can tell you that learning about lean at the source is a unique experience. The closer you get to the origin, the clearer you can see and understand the original purpose for each technique. The Japan EDM is hosted by Honsha, a network of former Toyota team members. Honsha’s missions to Japan include executives and practitioners from a variety of industries, ranging from healthcare to airport operations to manufacturing and many others. Darril Wilburn and Sammy Obara will be leading the study trip. (At least at the host companies. I'll be leading the trip at the bars and izakayas.) I’ve had the privilege to work with both of them many times — not only are they incredible lean practitioners, they're seriously nice guys (which is good, since we’ll be together for a week). My friend and colleague Mark Graban, lean healthcare expert and Japanese whisky aficionado, will also be on the trip as a speaker and facilitator. You can find additional information, along with a sample itinerary, on the mission website. Let me know if you’d be interested in joining us. October is a beautiful season in Japan, and it would be great to spend some time with you in Japan learning more about lean. I’ve been working with a company on a strategy deployment project recently, and noticed some common problems across the teams as they’ve worked on their hoshin plans. 1. No, you’re not an army of one. Leaders are smart and experienced, which makes them think that they can develop the hoshin plan on their own. But without including the whole team in the conversation, they may not be fully on board during the year. It’s equally important to include people from other organizational silos so that their efforts are coordinated and aligned with yours. The HR and Finance departments would love to know six months in advance that you need to hire two more process engineers, instead of dropping the request on them at the last minute. And you can avoid a lot of heartache if the sales team knows today that you won’t continue work on the new project that one of your customers was hoping for. 2. Projects are not chocolate: more is not better. Leaders are ambitious, and it’s difficult for them to turn down opportunities. However, it’s essential to face reality—there’s limited time, people, and money, and it’s impossible to do everything, no matter how appealing. Even companies that thoroughly analyze expected ROI for equipment or new products are usually not as thorough in calculating it for non-revenue producing projects. But that analysis is critical in enabling you to cull the list of projects from the attractive “nice to do” list to the “must do, can’t fail” list. 3. Fear the walking dead. And the zombie projects. Every group has “zombie” projects that seemed like a good idea at the time. Perhaps the projects seemed small and relatively easy at the outset. Or perhaps a customer pulled a Lucyand assured them that no, really, this time, they really would jack up their orders if the company just made this onechange. Even though everyone knows that they should kill these projects, they survive on momentum and a reluctance to forgo possible revenue. Be tough. Kill them. Individually these projects may seem insignificant, but taken together, they compromise the team’s ability to execute on the critical few hoshin priorities. 4. Beware the Hemmingway rule of bankruptcy. In The Sun Also Rises, Ernest Hemingway's character Mike Campbell explains how he went bankrupt: “Two ways. Gradually and then suddenly.” In an environment where you’re working on multiple projects at a time, it’s essential to check on progress at least weekly (if not daily). Monthly or quarterly reviews just aren’t frequent enough to identify and deal with the inevitable problems that arise—they lead to the “green-green-green-red” syndrome, where everything is on track until suddenly it’s delayed by two months. Frequent check-ins on projects will increase the likelihood that you’re able to stay on track, and if not, at least have more time to adjust. If Alan Mulally, the former CEO of Ford, could convene his top executives for a weekly business plan review, you can manage it, too. 5. For god’s sakes, not another email. Email is fast, free, and easy—unless you’re using it to stay on top of ongoing projects, or to solve problems. Then it’s slow and clunky, and the important information is at risk of disappearing into the bottomless pit of an inbox. It may seem charmingly retro at best, or a logistical hassle at work, but discussing projects while standing around visual boards that have project timelines, KPIs, problem solving worksheets, etc. posted on them is a better option. Avoid the temptation to deal with problems via a lengthy series of emails. It’s easier and more productive to address them when you’re all standing around the visual management boards, looking at the data together. 6. Look through the windshield. Not the rear-view mirror. We’re so used to looking at lagging indicators that we often don’t realize that they’re useless in helping us improve. You cannot drive forward (safely) by looking at the rear-view mirror. You have to look through the windshield to see where you’re going. If you’re trying to improve corporate culture, don’t just conduct an annual survey or exit interviews—track attrition rates and number of resumes received for job openings. If you’re trying to improve first-pass yield, by all means measure it—but also look at compliance with 5S policies, machine maintenance records, and employee training measures. These leading indicators are more useful than lagging metrics. Make sure that you’re choosing KPIs that tell you where you’re going, not where you’ve been. The mechanics of strategy deployment are actually pretty easy (even if you do use an X-matrix). But the way to make it truly superior to the strategic planning you’ve done in the past and fully reap the benefits of this powerful tool, is to avoid these six pitfalls. Well, not really. I doubt Netflix was thinking how Jim Womack would apply lean to their board meetings. But in a new article, the Harvard Business Review describes how the company reinvented board meetings by creating a better way to share information with its board of directors. The authors point out that without day-to-day exposure to the firm’s operations, directors typically have a thin understanding of the company. Their knowledge is based solely on turgid PowerPoint slides and carefully scripted presentations delivered by a chosen few executives. Netflix takes a different approach (to the benefit of the company and the relief of anyone who’s had to sit through a 175 slide deck). First, board members attend monthly and quarterly senior management meetings as observers. CEO Reed Hastings says that direct observation of critical management discussions “is an efficient way for the board to understand the company better” and develop trust in the leadership. By directly observing management, directors gain a greater understanding of the range of issues facing the company, the analytical approach that underpins managerial decisions, and the full scope of the tradeoffs involved. Ultimately, the aspiration is that this will translate to significantly more confidence in management and its choices. 30-page online memos in narrative form that not only include links to supporting analysis but also allow open access to all data and information on the company’s internal shared systems. This includes the ability for directors to ask clarifying questions of the subject authors. . . . The memo itself consists of written text that highlights business performance, industry trends, competitive developments, and other strategic and organizational issues. Directors receive these memos a few days in advance of the board meeting, during which time they can ask questions within the memo. Senior management responds to the questions prior to the meeting. As a result, board meetings are only three to four hours long, compared with the all day or multiple day exercises in tedium at many large corporations. Netflix doesn’t explicitly pursue lean, but its willingness to rethink how it operates displays the hallmarks of an organization that’s constantly seeking to reduce waste and increase the amount of time and attention that people can devote to value-added activities. (Read about the legendary PowerPoint on corporate culture that Netflix created to rethink HR policies and make life easier for everyone.) Too many companies apply lean thinking only to manufacturing operations where the direct labor and material costs make it easy to calculate benefits. Netflix shows clearly that lean thinking can benefit a company everywhere.